What do you think of when you think of the Fall? Glorious colours, misty mornings, shuffling through leaves, an abundance of fruit, nuts and seeds. Well, this stunning necklace brings all those images together in one glorious design. 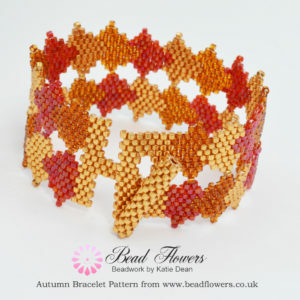 If you’re a fan of seed beads, then you will love this project. It’s great for beaders who have a bit of experience. You’re going to be using brick stitch and Peyote stitch. These are staples of the seed bead repertoire. So, look this is Fall beading at its best! Now you’ve got the necklace, you’re going to need a bracelet to go with it. 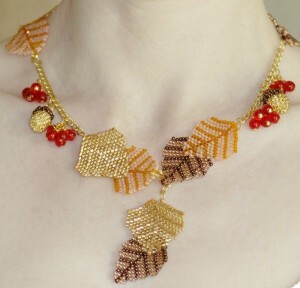 Well, this fabulous design uses a more abstract idea to incorporate leaf shapes in the Fall colours. If you like versatility, then this is a project you can re-colour for any season. This tutorial is great for anyone who is still developing their techniques. It may look complicated, but it actually builds on basic odd count Peyote. Best of all, the tutorial is supported with free technique guides too! Fall wouldn’t be complete without a Halloween party. And what do you wear to a Halloween party? 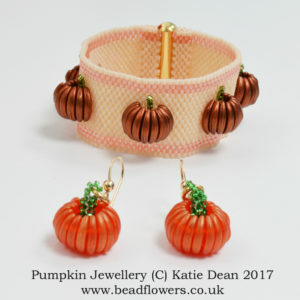 Well how about some Pumpkin jewellery? This is another quick and easy pattern, with beautifully written instructions. So, you can run this up as a last-minute project. Then you’ll be the envy of all your party friends! Perhaps you’re one for French beading? Then, I’ve got a great recommendation for you. We often think of French beading as a technique for making flowers (and yes, there are some great flower patterns for the Fall). But have you ever thought about making beaded fruit? 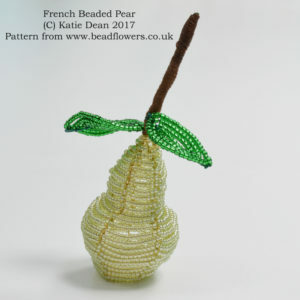 Well, how about a beaded pear? Combine it with the apple pattern from the same website and you could end up with a complete fruit bowl! Fall Beading Project 5: Wine! What is Fall without the Harvest? Well, it’s been a good year for grapes. So, that means a good year for wine! 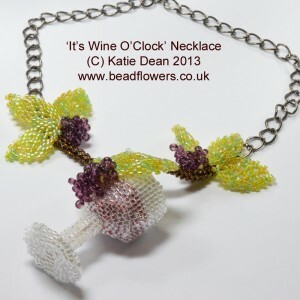 If you feel like celebrating ‘wine o’clock’ any time of day, then how about this cute necklace? I’m finishing where I started, with another seed bead project. This is perfect for more advanced seed beaders. So, if you like a more meaty project, this could be the one for you. Plus, if you prefer kits, this one also comes as a complete kit. So, no panicking about whether you’ve got the right beads in your stash. You can just go ahead and get beading! If those five ideas have given you a taste for Fall beading, then check out this fabulous collection of patterns and kits. I guarantee you won’t be short of inspiration for the season!